Michael's bloggy blog! : Tina come get some ham! Tina come get some ham! Ah hoi hoi, we have a little gallery going on in work where you can do a picture and put it up on the wall so this was printed out in a5 and framed. 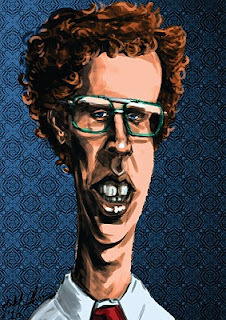 It's the first time I've seriously tried to do a caricature so I think it was wise to go with someone with very distinct features like Napoleon Dynamite. It's a pretty rough around the edges but I'm fairly happy with it based on the amount of time I allowed myself to do it, roughly 2/3 hours. Hope you dig! Waaaheeyyy Mr'ta Mr'ta!... sorry it took me o so long to check in. Its been a wacky few months, to say the least. Loving this, its really great, and your first serious attempt, me thinks theres a bit of a caricaturist in yo'r blood. nice man! The gallery thing is a good idea!